Santamedical products offer clinically proven technology and are used by physicians and hospitals around the world. 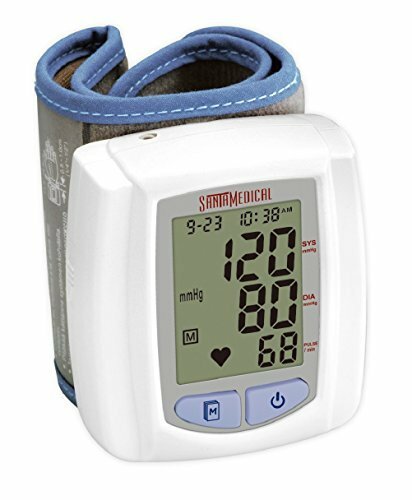 Compact, portable and simple-to-use, the Santamedical blood pressure monitor is an advanced wrist cuff monitor with advanced technology that automatically inflates to the appropriate level (no adjustments required) while reducing measurement time. This advanced capability adds convenience and ease of use to those with conditions (such as arrhythmia) that lead to fluctuating blood pressure. With ample memory, the Santamedical blood pressure monitor stores up to 60 blood pressure readings with date and time memory recall. Based on a wrist cuff design, the santamedical blood pressure monitor is especially helpful for users with above average arm sizes. 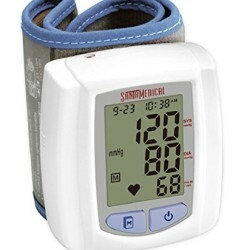 Backed by a 1 year warranty, the santamedical blood pressure monitor ships quickly, and user manual. Specifications-large lcd size, 60 groups memory function; date and time function; automatically inflate; power: 2 AAA size alkaline batteries; automatic power-off function; measuring range: pressure: 30 mmhg-280 mmhg; pulse: 40 to 199 times/min; measuring accuracy: pressure: 3 mmhg; pulse: 4 percent of reading. For safety purpose, this device is also equipped with the function of emergency stop. This function can make users have the feeling of trust when operating this device, especially for elders.